We know how to pack for shipping! Let us pack your kitchen items, plates, mugs, pots, crockery and dishes. Kitchen is probably where you will sped most time on packing. Plenty of fragile dishes, sharp knifes, breakable pots and jars, delicate china porcelain require packing materials, boxes and the expertise on how to pack those brittle kitchen items for shipping. We are happy to do it for you! Should you decide to pack, for all our clients we provide packing tips and advice on shipping kitchen items to Australia. We provide packing materials and boxes for shipping plates, jars, pots, mugs, crockery, pans, tea pots and more. While moving a house or relocating to another country, one of the biggest headache is indeed international packing and in this regard a vital area of the house that needs additional observation is the kitchen. This is one room which comprises of ample small, fragile items which one requires in taking with them to their new abode. All the appliances, dishes, utensils, crockery, pots and pans needs to be dealt with carefully while packing kitchen items for shipping. No wonder moving or packing kitchen items is more time consuming than other rooms and thus it needs one's special attention. Dish barrels are undoubtedly the best. These are fabricated from cardboard that is strong and thick for absorbing travel shocks as well as protecting the dishes. Although these are a little pricier compared to regular moving boxes yet are worth it. One should ensure in setting up the boxes accurately and correctly tape the bottoms. It is advisable to use wide packing tape that is strong and of good quality. An applicator or tape gun will make the task easier together with a little practice will help one to find them easier in setting up. It is essential to draw tape up the sides and across the bottom for additional security and thereby keeping the item's square while taping. One can use newsprint especially for packing breakables yet every piece will need washing while unpacking. How to pack Plates for moving? - When it comes to packing plates, one should pack them vertically rather than stacking these above each other. 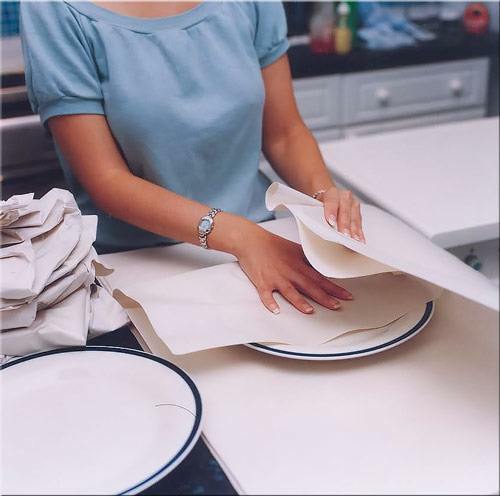 In fact packing plates for shipping in this manner will work wonders in reducing the pressure on thinner, vulnerable china in the middle of the plates indicating that there are lesser changes of it falling a victim to the jostles and bumps during the move. How to pack Glassware and China? - Wrap every piece of glassware and china individually. With the help of a few sheets of paper, begin from the corner and wrap diagonally and persistently tucking in the overlapping edges. Here a newsprint of a double layer will serve apt as outer wrapping. Besides a good amount of cushioning and paper padding is needed for every glassware you want to ship and china such as plates, glasses, cups, bowls, crockery and so on. Lastly, label the boxes with the contents Fragile-This side up. 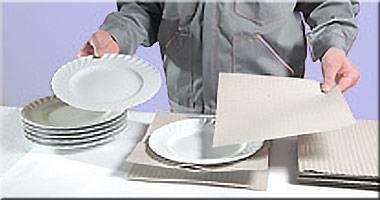 Packing Cutlery and bowls for shipping - Based on the weight, these may be utilized for the middle or bottom layers. These should be packed for moving in the same manner as flat plates. One should stand the shallow bowls such as soup plates on the edge of the box and the deeper bowls like mixing bowls nesting three-four together in an upside down manner on their rims. Carefully wrap the lids of sugar bowls in newsprint turning each upside down above the bowls. Next, wrap together both in newsprint with double outer layers. One should wrap gravy boats, sauce container, cream pitchers, sugar bowls and similar items in newsprint followed by double outer wrappings. Position every item upright inside the box and then covering off the layer using wadded newsprint. It is always advisable in placing breakable goods such as dishes, cups and glass to be send to Australia at the top portion of the carton from preventing these from being smashed. Each item should be separately wrapped to prevent scratches and cracks. Tape the packing paper with the items firmly to avoid friction and movement. Post filling the boxes if there is any empty space inside, it should be crumpled with packing peanuts and crumpled paper as these will cushion every breakable piece when these are carried. Besides, another smart option while packing kitchen items for shipping to OZ is in putting bubble wraps in all four corners of the carton for similar reason. To pack kitchen utensils for shipping you can use book boxes. The boxes that one utilizes are extremely important. For minimizing damage, one should pick cartons suitable for their items. One must always ensure that their cartons are neither too heavily packed or too light as in the former these are likely to break open while in the latter these are likely to crush when stacked. Thus, utilizing the right box and packing it appropriately while shifting for packing breakables, glassware and china can guarantee a safe and secure removals to Australia of such precious cargo. One should use further packing materials, particularly for thinner boxes. Visit this page to find out packing and shipping costs to Australia. Kitchen appliances and products are fragile to pack and shift. Thus if this is not practiced properly, these can get damaged, leaving one to spend enormous for replacing the same. Fret not, as one can prevent this hassle via packing them precisely so that one’s cooking utensils and kitchen appliances arrive unharmed in OZ.